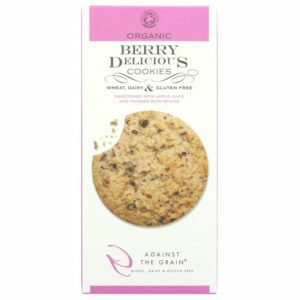 As part of the Against the Grain biscuit range, Berry Delicious cookies are wheat, dairy and gluten free. Lightly spiced and crumbly, these delicious organic cookies are packed with cranberries and raspberries. Sweetened with apple juice, they are perfect for those who are trying to avoid refined sugars! Not only suitable for those with allergies but also for vegetarians, vegans and cookie lovers alike. This product is Gluten-free, is Organic and is Vegan. 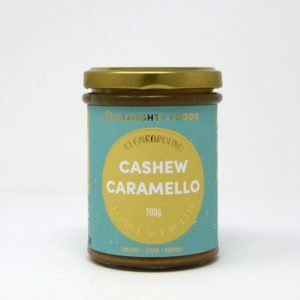 Almighty Cashew Caramello is a caramel like spread made from raw cashews, dried coconut, tigernuts and coconut sugar. It's stoneground to a silky smooth, velvety texture and is perfect for spreading, dipping, drizzling, blending, sharing or just as a general tool in your arsenal of feel good culinary magic. So very very tasty! Certified organic with the Soil Association, ethical, vegan & paleo friendly, soy & dairy free, non GMO, free from refined sugars. Handmade in Scotland. 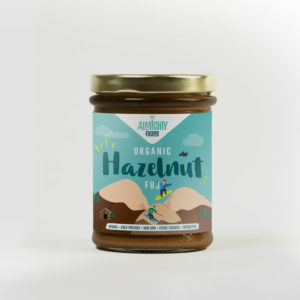 This luxuriously rich coconut & sprouted hazelnut butter sure is almighty. 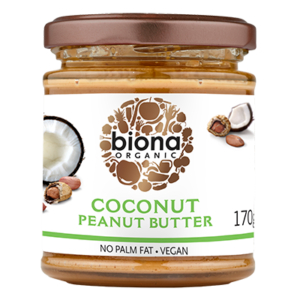 Its velvety smooth texture is created by grinding dried coconut flesh, soaked and sprouted hazelnuts, coconut & raw cacao powder together. It's decadent flavour is the the ultimate yum! Certified organic with the Soil Association, sprouted, ethical, vegan & paleo friendly, soy & dairy free, non GMO, Free from refined sugars. Have you ever tried a fruity nut butter? This stuff is honestly amazing! 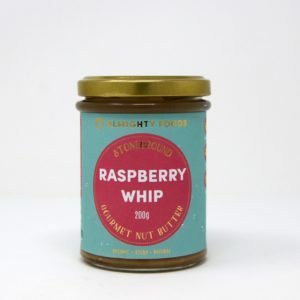 This soft and gooey cashew nut butter is in infused with zingy dried raspberries. Stoneground at low temperatures to a silky smooth texture. Certified organic with the Soil Association, sprouted, ethical, vegan & paleo friendly, soy & dairy free, non GMO, Free from refined sugars. CBD Chocolate, yes you heard us! Perhaps the first of its kind in Europe. For Almighty Foods, this is but the first of many in a series of products that pay homage to the wonder that is the hemp plant! Raw CBD concentrate, infused with their 68% dark Peruvian chocolate. 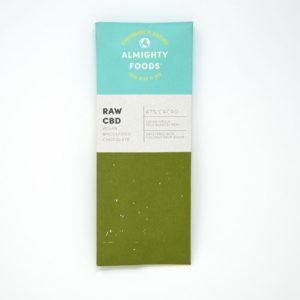 Each bar contains 10mg of CBD. The CBD that we use is made from hand harvested hemp grown in in Europe. The bars taste, at first dominantly of cacao, but follow with strong and rich herby notes from the hemp concentrate. A unique synergy of botanicals make this one of the most innovative chocolates on the market right now. 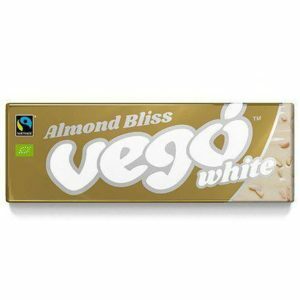 99% certified organic ingredients, ethical, vegan & paleo friendly, soy & dairy free, non GMO, free from refined sugars. Cacao* (cacao butter, cacao beans*), evaporated coconut nectar*, raw hemp extract (CBD 10mg per bar). Chocolate contains cocoa solids 67% minimum. *=certified organic ingredient (99%) Allergy advice: for allergens see ingredients in bold. May also contain traces of peanuts and other tree nuts. Made in a factory that handles sesame seeds. 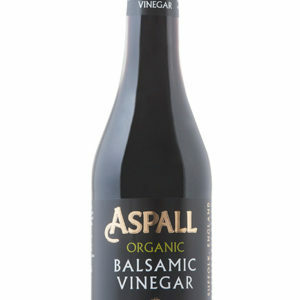 Aspall organic balsamic vinegar is a beautifully smooth sweet vinegar flavour with a delicate kick of sharp bitter flavour. This rich, gourmet flavour can give a boost of exquisite taste to a dressing, sauce or to a main dish. It can be reduced down and used as a glaze over vegetables or tofu. A few teaspoons of Aspall Organic Balsamic Vinegar can boost flavour to your gravy. Try Balsamic Vinegar drizzled over fresh strawberries. This is a certified organic product. Suitable for vegetarians and vegans. It is a naturally gluten-free product. 350ml.